While in early 2018 there was the expectation of a continued modest rebound of Italian construction performance, this has not materialized. To the contrary, in 2019 the sector is facing one of the most challenging periods since the beginning of the economic crisis in 2008, with subdued demand and further deteriorating profit margins. In the residential construction segment investments made in 2017 were still more than 60% lower than in 2008, which could not be compensated by a 20% increase in restoration work (mainly based on public investments). Investments in new residential buildings grew just 2% in 2018, and the backlog of unsold houses still amounts to 1.4 million units. While investments in commercial construction have modestly rebounded since 2016 (e.g. investments in malls and industrial plants increased by about 2% in 2017 and 2018), the 2019 outlook is hampered by lower GDP growth and increased economic uncertainty. 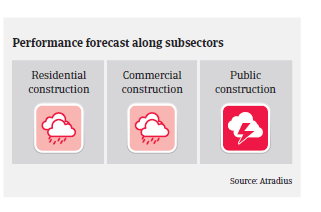 Public construction investment remains far below the 2008 pre-crisis level. While the number of public tenders rose 33% in 2018 (up to EUR 29.7 billion, driven by investments in railway infrastructure), financial coverage could be an issue due to increased uncertainty about future spending capacity. 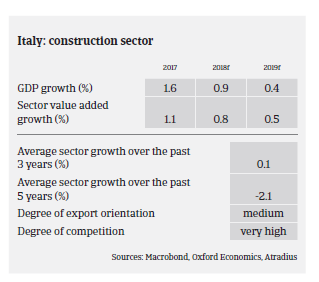 Besides the still low spending capacity, ongoing tight lending conditions set by banks remain one of the main reasons for the subdued performance of construction, exacerbating the fact that many Italian construction businesses are highly geared. New loans for construction businesses decreased 12% year-on-year in value in 2018, more than for any other Italian industry. Larger construction companies have looked for alternative liquidity sources such as bonds, but those are more expensive than bank loans when operating margins are low. Payment experience in the construction sector has been bad over the past two years, and non-payment notifications were at a very high level in 2018. 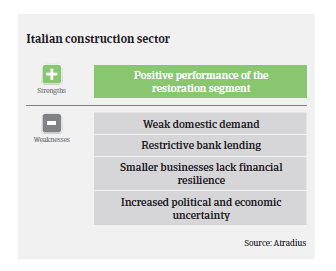 Last year several of the top 50 Italian construction businesses went insolvent or faced severe liquidity crisis. This was mainly due to devaluation of trade receivables and order backlog in some markets abroad (Algeria, Venezuela), high financial leverage to finance the working capital requirements and capital expenditure, and slow payments from public clients. The business failures of larger players have affected many subcontractors and suppliers of cement, concrete and steel. 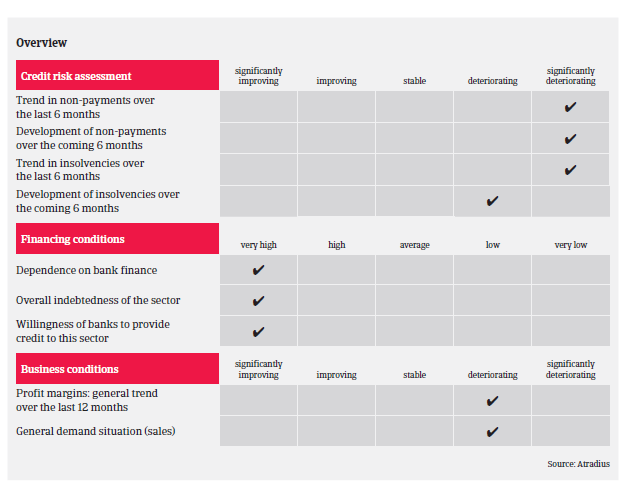 Therefore we expect that in 2019 both the number of non-payment notifications and insolvencies will sharply increase. Due to the adverse insolvency development, subdued demand for residential buildings, uncertainty about the future spending capacity of public bodies and their persistent bad payment behaviour our underwriting stance is very restrictive for all main subsectors. However, we observe that the restoration segment still performs well, while the same accounts for certain export-driven construction material segments (e.g. ceramics, tiles, and glass).